The term waste to energy covers all methods in which energy can be recovered from waste, that is, rejects and residuals. Currently, combustion processes are established; other methods such as pyrolysis or composting have not been feasible on a large industrial scale up to now. In addition to conventional RDF combustion and rust firing systems, stationary or circulating fluid beds are also used in combination with biomass in the energy recovery process. In paper production, for example, energy recovery processes that use rejects and residues in whole or in part require careful preplanning and technical development to ensure the reliable and economic operation of the plant. Sludge collecting buffer in a newsprint mill generating 500 bone dry tons of sludge per day. 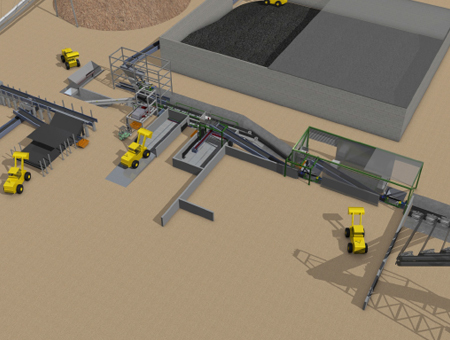 A swiveling screw conveyor discharges the dewatered sludge to make the best use of the available buffer volume. Typical storage system for high- and low-caloric residuals feeding incineration, using cranes, live bottoms, and special conveying equipment. Shredding and metal separation is the precondition for combustion of the high-calorific rejects. A closed pocket belt conveyor allows for transport on long distance and complicated stretches.